Rosie Barnett’s parents didn’t know what to expect when they learned that their fourth child was diagnosed with Down Syndrome. They were handed booklets filled with information about the condition, but the baby girl’s future was uncertain. Jason Kneen and Hannah Barnett of Faberstown, United Kingdom, took the diagnosis in stride — they didn’t see their daughter’s genetic condition as a burden or inconvenience, but a unique opportunity to embrace Rosie’s inherent gifts. Kneen was overwhelmed with the amount of information and stigma associated with Down Syndrome. The diagnosis was difficult for him to comprehend at first, but his feelings began to change as the realization that he could not predict his children’s future began to set in. In February, Kneen posted a series of tweets about his four-year-old daughter Rosie and her Down Syndrome. He said his posts were meant to be a candid look at what it’s like to raise a child with the disorder. He also shared how his thoughts and emotions about raising Rosie have transformed over years, and reflected on the wonderful and difficult moments he and his wife have faced during this process. His posts gained attention online, getting thousands of re-tweets on Twitter. "My child has Down's Syndrome, what should I expect?" Even Dwayne ‘The Rock’ Johnson weighed in. The Barnett’s experience with Rosie is shared in many ways by the loving families of people with Down Syndrome around the world. One in 1,000 babies are born with Down Syndrome worldwide, according to the United Nations, and about 6,000 new cases appear in the U.S. each year, according to the National Down Syndrome Society. Although all people with Down Syndrome will experience some cognitive delay, the effect is usually mild to moderate and is not indicative of the many strengths and talents that each individual possesses. “The outlook may vary depending on the child, but all children are entitled to a supportive and highly structured educational program,” said Daniel Montalto, a pediatric neuropsychologist and director of the Neuropsychology and Learning Service at NYU Langone’s Child Study Center. “A child with down syndrome often requires specialized instruction in functional or ‘real world’ academic skills. In addition to academics, it is important that educational programming include training in independent living skills, community skills, and vocational skills. With these supports in place, a child with Down’s will continue to make gains throughout his or her life,” she added. Rosie, who is enrolled at St. John the Baptist Catholic Primary School in Andover with her three older siblings, attends classes with children in a traditional learning environment. At school, she has a one-on-one aid, and since she is currently non-verbal, she’s learning sign language. 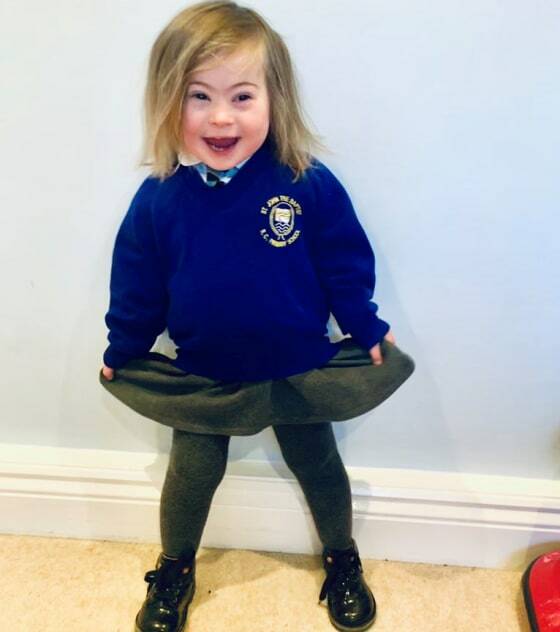 Rosie is the first child with Down Syndrome to attend the school, Kneen said. The school’s approach to inclusion is to ensure all children have fair and equal access to education, said Catherine Whatley, head teacher at the school. The Deputy Head of the School of Education at the University of Queensland in Australia, Dr. Rhonda Faragher, has dedicated her career to the advancement of inclusive education. This type of education encourages diverse groups of students to learn in the same classroom environment with the same curriculum, according to its supporters. This style of teaching and learning is not only helpful for the Down Syndrome community, but also all students, according to some education specialists. Faragher began advocating for the Down syndrome community more than two decades ago after the birth of her daughter, who has Down Syndrome. “It’s great for a kid and families to see a person with disability, to engage with them in a workplace, rather than [see] a person with disability be cared for,” said Faragher. She and other advocates drafted a set of guidelines for inclusive education which will be released in a presentation taking place on World Down Syndrome Day — March 21. The event held at the United Nations Headquarters in New York City will adopted the resolution in an effort to spread awareness and encourage inclusive societal advancement for the Down syndrome community. A sobering reality of raising a child with Down syndrome is the financial cost. The increased cost is due to the extra resources such as speech and occupational therapy as well as medical cost associated with heart and brain and cancer conditions for which people with Down Syndrome are at higher risk of acquiring. Additionally, life expectancy for people with Down syndrome has increased dramatically in recent decades — from 25 in 1983 to 60 today, according to the National Down Syndrome Society. But when caring for a child with Down Syndrome, cost is the last thing a parent thinks about, Kneen said. Rosie is thriving at school and also at home; and she’s learning to be resilient. That is the ultimate reward, he added. “When she’s playing with her siblings, running around the house, and the family dog knocks her off her feet, she’s learning to get back up on her own,” said Rosie’s parents.